Review: "Maze of Time: Masquerade Show" - Sea of Tranquility - The Web Destination for Progressive Music! Once again, here we have another very good band from Sweden (bet you are all getting tired of hearing us say that! 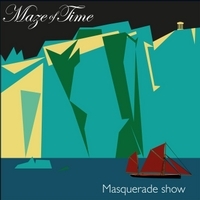 ), but Maze of Time are squarely in the progressive rock/progressive metal camp with their latest for Art Performance Production titled Masquerade Show. This is a very solid release from this talented band, and it's a shame we received this one so late in 2012 as it no doubt would have garnered plenty of interest as a strong title from last year. Masquerade Show is the bands third release, and as of this writing they are comprised of Robert I. Edman (guitar, vocals), Jesper Landen (lead vocals), Jan Persson (bass), Alex Jonsson (keyboards), Thomas Nordh (drums), and Bjorn Ohman (backing vocals). These guys like their progressive rock, and the best way to describe their style is a cross between Fish era Marillion, IQ, Genesis, and the prog-metal stylings of Dream Theater. The near 10-minute title track kind of brings all those influences in at the same time, as some of the dark, atmospheric passages reminds of those early Marillion albums, complete with mysterious vocals and vintage sounding keyboards, but then you also get complex, heavy prog-metal guitar passages as well as pastoral acoustic guitar. Landen's vocals are an enjoyable mix of Fish, Peter Nichols, and Peter Gabriel, and he's in fine form on the melodic rocker "Pandora's Box" and the lush "Mile By Mile", the latter a real gorgeous pop/prog number complete with soaring vocals, lilting guitar textures and keyboards.There are a couple of hot instrumentals here too, such as the Dream Theater-meets-Deep Purple track "Dark Matter" and the haunting "Next Morning", which is a lovely vehicle for Jonsson's majestic piano. The heavier numbers are also quite impressive, like the Uriah Heep sounding "Mile By Mile" and the crunchy yet atmospheric "Mean Messiah, Man Machine" which has some spooky keyboards, fat bass grooves, and powerful vocals. Perhaps the strongest track however is the intense "Predator", a real tasty prog number that recalls classic IQ but with slightly heavier guitars. The chorus is extremely catchy and the overall instrumentation throughout is spot on. Closing number "Humanoid" is sweeping melodic prog rock, again with the influence of IQ, Marillion, and especially Gabriel era Genesis popping right out at you. Great guitar & keyboard textures on this one, as well as layers of lead and backing vocals. What's refreshing on Masquerade Show is the band decided to let the songs speak for themselves rather than load this album up with tons of solos and extended instrumental passages, though when they do rip off a guitar or keyboard solo it's usually quite spectacular. This is all-around very solid stuff from a Swedish prog band that I think has all the tools to really make a name for themselves on the modern progressive rock scene. This band is just brilliant and they deserve a bigger fan-base than they currently have.